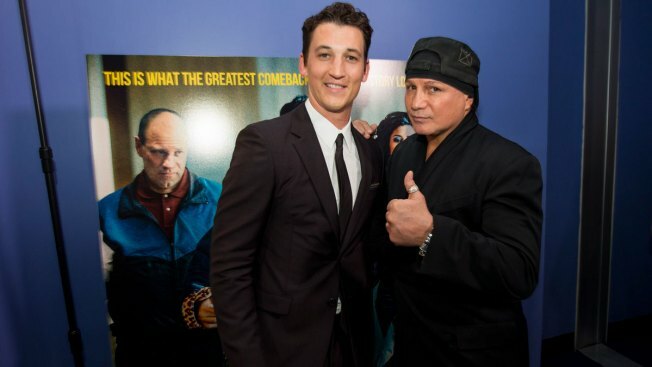 Actor Miles Teller with Vinny "The Pazmanian Devil" Pazienza, who he plays in the movie "Bleed For This" at its Providence premiere on November 10, 2016 in Providence, Rhode Island. Police are now seeking Pazienza in connection to an assault. Retired boxing champion Vinny Paz, whose comeback story after a car crash was dramatized in the 2016 film "Bleed for This," has been accused of attacking a Rhode Island man and sending him to the hospital. Providence police say they were called to a home early Tuesday morning. They say when officers arrived, witnesses told them Paz had accused a friend of stealing $16,000 and then assaulted him. The man was taken to the hospital with injuries including several broken teeth, a black eye and bite marks that drew blood. Witnesses told police that Paz left before police got there. The ex-champion wrote on Twitter Tuesday morning to "stop" with the nonsense story. He also told WPRI-TV that he got robbed, "and when that happens, you gotta do what you gotta do." Police say they are trying to find Paz to speak with him.